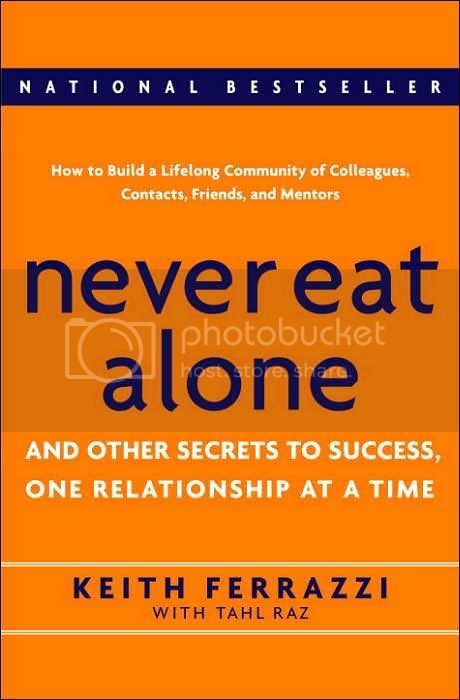 I just read this book about contacts, friends, and mentors. The author is supposed to be the most "connected" man alive and being the social butterfly that I am I look to follow in his footsteps. I am setting a goal for myself to have lunch, coffee, or other organized convos with 100 people in the first 3 months of my move. On the list are old friends, new ones, architects, designers, festival goers, friends of friends and generally interesting people. I have a list of about 40 so far and hoping that those 40 can point me to more and so on to my reach my goal. I have 4 coffee/lunch dates set up this week! Keep me busy- I know you guys know some interesting folks in the area so give me a shout and tell me who I should meet. For those that are interested in broadening your network, here are some key points from the book. Who do you know that I should meet? ok lindsay... im going to pick it up and give it a read... but im still not certain about the whole talking to others... hope you are well! okay lou! tell me what you think. i am well. same to you! Marie Anne Ory Your blog is inspiring Lindsey! I would consider it an honor if I was chosen for one of your lunch dates. I understand the concept of the book, but I LOVE eating by myself. I get carried away when eating with friends and am not able to concentrate fully on the flavors going on in my mouth. It certainly is a treat to steal away an hour for lunch with a new friend, though.